Here I’m starting couple of posts about not very known features of BEx Analyzer. One of them is called “Cumulate Values”. 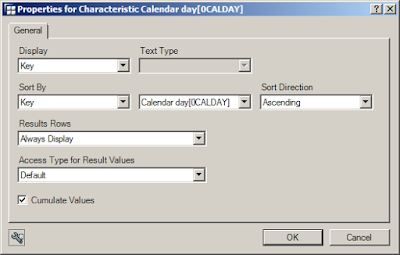 It is available in context menu (right click) on characteristic’s cell while BEx report is opened in BEx Analyzer tool. What it does is following. It cumulates a value of KF for specific characteristics shown in the report. This works without considering what aggregation type is defined for particular KF. 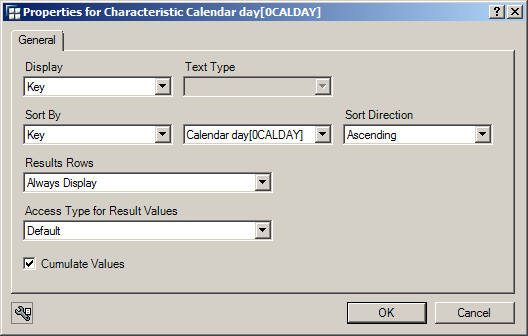 To enable the feature a right click is performed on the characteristics Calendar Day and menu item Properties is chosen. On next pop-up windows the feature is enabled. In this post I look back to pre-2000 years to times when new millennium was approaching. Back then all computer industry was scared in wake of what will happen when computers clock turn from 31.12.1999 23:59:59 to 1.1.2000 00:00:00. This problem was known as year 2000 problem. SAP was watching this space also and preparing its software for this change. They came up with SAP Note with very famous number: 2000 - Internal SAP AG Year2000 activities. In this Note they briefly described what this year change will bring and advised its customers to prepare their computers system for this change. Initiative of the year 2000 within SAP was driven by so called “Year2000 Taskforce” (y2000@sap-ag.de, sap.com/y2ki and sapnet.sap.com/y2000). The taskforce coordinated all activities related to this change. Covering all known facts, problems, methods, tools, organizational and legal questions. All analyzing and testing of SAP software done for this year change generated about 130+ (based on my brief count of Note numbers in collective Notes) SAP Notes. They vary from databases and OS related changes by different vendors, date field format adjustments in SAP tables like date 1.1.1 is converted to 1.1.0001, ABAP statements like “WRITE date YY/MM/DD”, file format generated by SAP interfaces and so on. SAP provided also couple of tools to help customer with testing of their systems (like Safety Check 2000 tool, Verification Tool). Customers were encouraged to setup separate system where they shall simulate the year change and test how the SAP software will be affected. In today’s post I introduce another important customizing table of BW. Among tables like RSADMIN and RSADMINC it is RSADMINA table. Similarly to previous ones it also stores params need to BW system functioning properly. BWMANDT Unique client in BW. For the BW system a value of this param must be maintained. BWMANDTRFC Multiple Client Function: Destination in BW Clients. In case BW is used in as system with more than one client then this param is used. It can be a case of an APO system since APO customizing is client dependent unlike BW where it is independent. Param technically enables working with BW in different clients. TPBWMANDTRFC After-Import: Destination in Target Clients. This parameter is a destination used during the import post processing for the logon from client 000 into the target client. DEBUG_USER User permitted for Debugging. Some of BW processes (e.g. staging: loads, DSO activation, etc.) perform a checks for this user and these processes are forced to wait for a specified amount of time before they continue. Therefore never run BW processes with this user. MONFILLED Monitor initialization completed. Used internally if monitor is run for the first time and has made its initial entries. IDOCLASTNBR Last IDoc type number. Param used to define and make unique the name of the basic IDoc type for the source system connection ('number range'). ENQ_PROT_ON Switch-on Logs for Lock Manager. Writes an application log for each lock that is requested in the lock manager. ODSSERVGROUP Server Group (RZ12) for RFC Call when Activating Data in DataStore used for parallel ODS activation. The parallelization accesses the active table when determining the system ID and during the insert operation. Use tcode RSODSSETTINGS to maintain the param. HIERREL Release status of application hierarchy DWB (OBSOLETE). . Is evaluated while metadata upload takes place to decide whether the hierarchy is overwritten or not. Used in release 2.0A below . Similarly to maintenance of table RSADMIN we need to maintain also other BW’s customizing tables. Some of these are tables RSADMINA, RSADMINS and RSADMINC. The tables stores important customizing parameters. There is a bunch of special tcodes which enable maintenance of table. RSCUSTV30 Load Distribution for Analys. Proc. Apart of the special tcodes there is also other more straight forward way how to maintain particular parameter of the tables mentioned. It is function module RSCC_RSADM_ACC. However a prerequisite is there that the parameter that is supposed to be maintained must be known upfront. Scheduling a process chain (PC) is regular activity done by BW administrator very often. When it is going on usually we start tcode like RSPC and in PC’s maintenance screen we do scheduling of the PC via F8 button. There is a job at the end scheduled in the system which actually runs the PC. 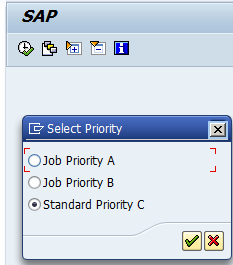 While we do the PC scheduling as next a popup which asks us to enter the job priority comes. Usually not many people know what that the job priority is about. On the popup there is a radio button with three positions: The job Priority A, B, C. By default it comes preselected to position of A. Sometimes the job priority is called as the job class in other words. Difference between the job classes is that when the job is selected as A then work process will be locked for particular job. If it is class C then it will be waiting the work process. If there would not be a job class specified by user in method ACTIVATE of class CL_RSPC_CHAIN it would be set to C. Therefore it always safety to put job class C while scheduling the PCs. By this we avoid locking the work process.